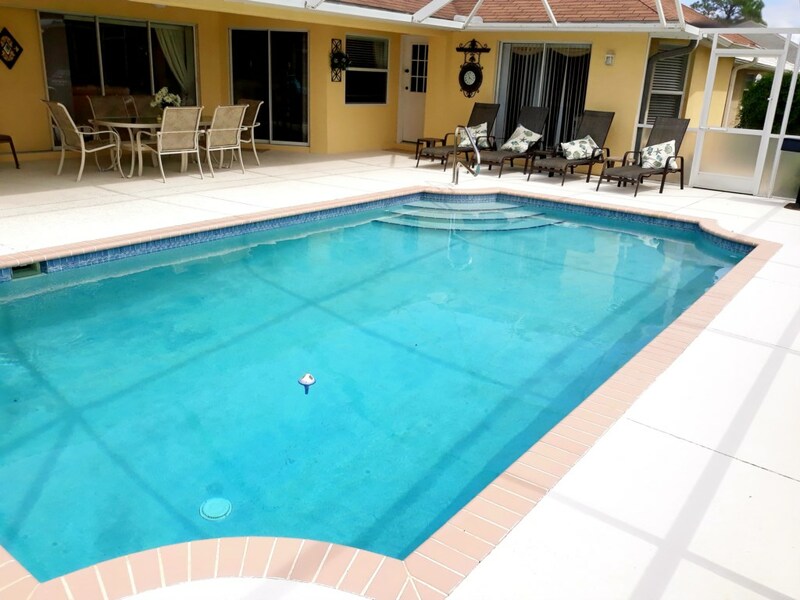 3 bedroom, 2 bathroom villa in the Rotonda West community. Owned by Val Easton. Ref: 1267. A beautiful villa in an outstanding setting. Having travelled and lived extensively in Spain and Australia, it's taken until now to discover the joy of Rotonda! And what a haven it is, tranquil and so interestingly back to nature and for us "as good as it gets"
and boating. Young enough to venture beyond to the exciting places not too far away. Not to mention the greatest shopping! Do come and find out for yourselves! Heated pool, gas BBQ, electricity, cleaning prior to arrival and after departure, phone calls throught the USA, wireless high-speed internet connection (you just need to bring your own laptop, I-pad, I-phone, internet radio for all your favourite stations and internet printer for boarding passes and store vouchers. 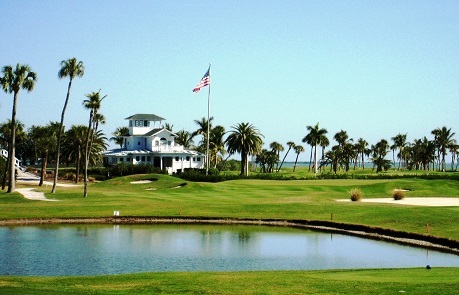 With weather that is perfect nearly all year round Rotonda West is one of Florida’s best kept secrets on the beautiful Cape Haze peninsular between Sarasota and Naples. The beautiful white sandy beaches of the Gulf Coast are a short drive for sun-bathing, shelling, hunting for sharks teeth, or watching dolphins at sunset. 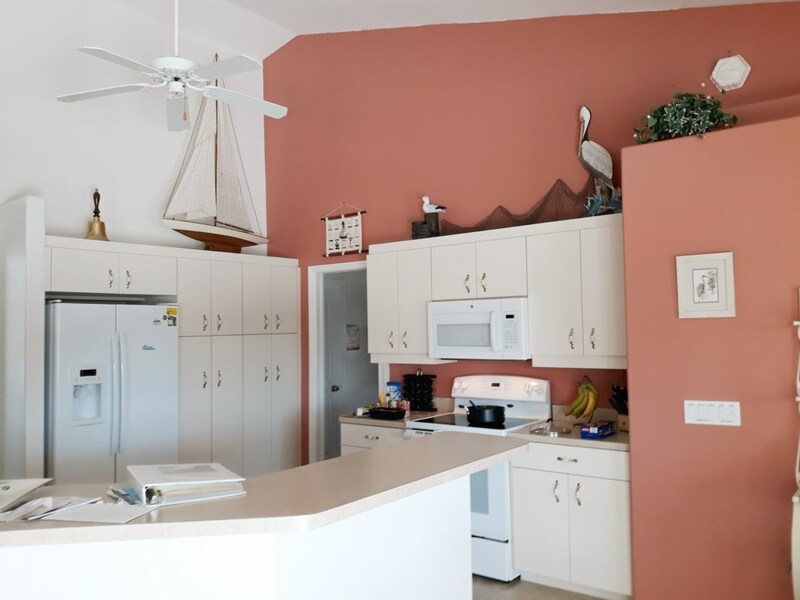 Boat trips (and boats for hire) for sailing and fishing excursions are available from local marinas or you can take a boat trip along the Intracoastal Waterway where you may see dolphins and even a manatee. For the sporting enthusiast there are five golf courses and a 24 hour floodlit course all within ten minutes’ drive. 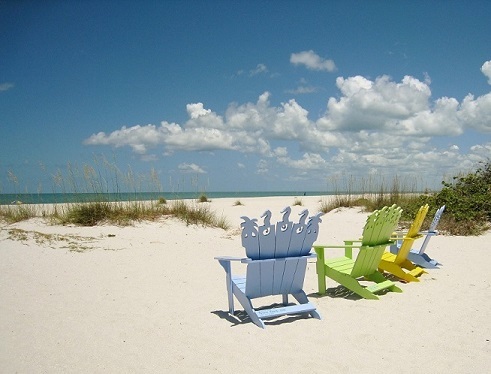 Whatever your ideal holiday, this is the perfect spot for simply relaxing and seeing the real Florida. 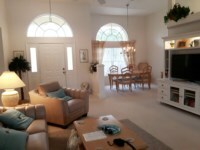 Close by are Englewood, Venice and quaint old Boca Grande/Gasparilla Island. At nearby Port Charlotte there is one of the largest Malls in Florida or, for the really dedicated shopper, there are two enormous designer outlet malls within an hour’s drive. There are several excellent restaurants in the area and Rotonda West also has three supermarkets within 10 minutes. 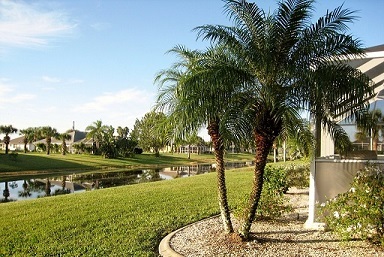 Heron's Way is situated on one of the quietest roads in Rotonda West – the perfect spot for a relaxing vacation. With very little traffic passing, most of the time the only noise is birds during the day with Cicadas and the odd croak from frogs in the canal at night. The stunning spacious villa is furnished to a high standard. The south facing heated pool overlooking a freshwater canal is the perfect spot for relaxing. The wide lanai gives an uninterrupted view along the canal for enjoying breakfast or coffee in the morning sun while planning your day. Later in the day the lanai provides shade for an al fresco lunch or a cool spot for enjoying a barbecue as the sun sets. 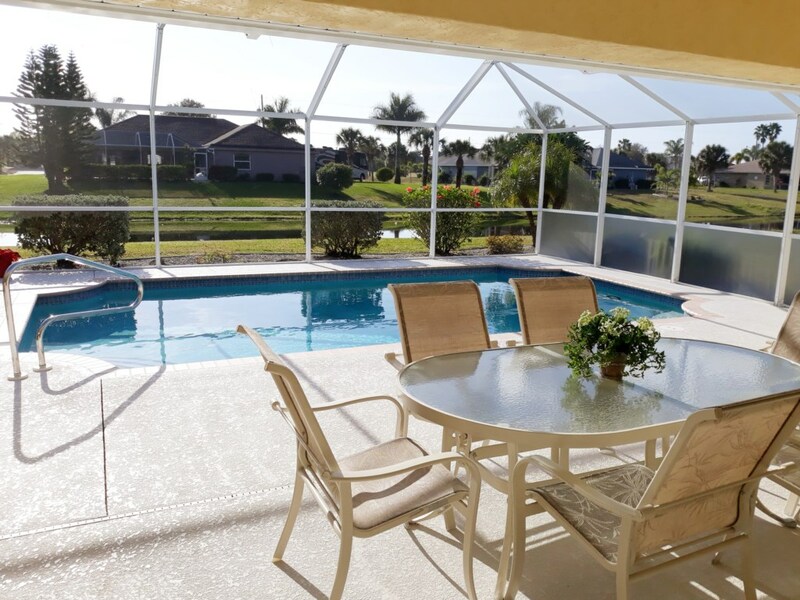 The fully screened pool area has plenty of room for sun-bathing with a cool spot under the shady lanai if you have had enough sun. With solar and electric heaters for cooler days the pool is kept to a pleasant 86F nearly all year round. It can also be floodlit for evening swims. There are plenty of books for poolside relaxation but it is only too easy to get distracted by wildlife. Rotonda West has its own Nature Reserve so you are never very far from nature. 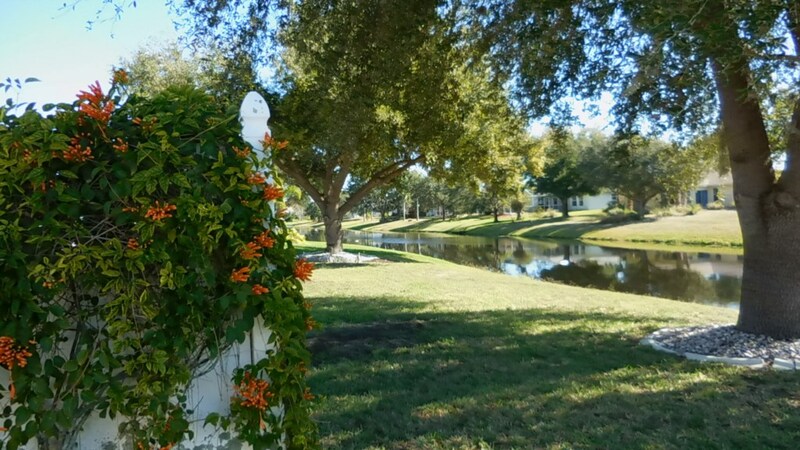 The garden beyond slopes down to the canal with abundant wild-life - a bob-cat, herons, egrets, wood-stork and even ospreys and a bald eagle have been seen fishing. In the garden Red Cardinals, Humming Birds and Mocking birds are often seen. Rabbits, raccoons and armadillos have also visited our garden. Our local Management Company is also close by should you need them. 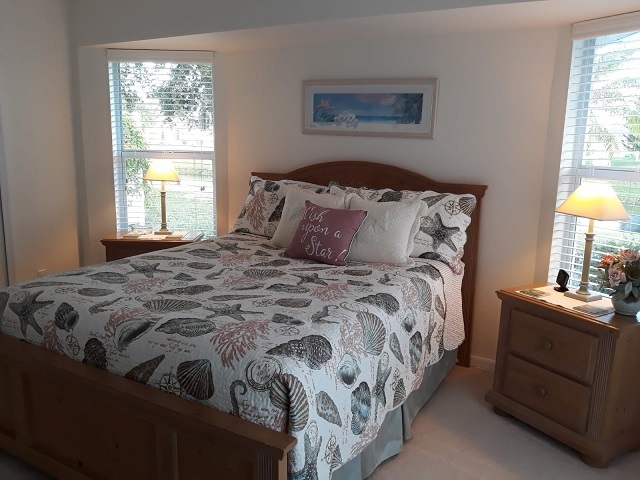 We regularly visit to make sure everything is kept to the standard we would hope to find and to guarantee your holiday home is a place where you can simply relax and enjoy. 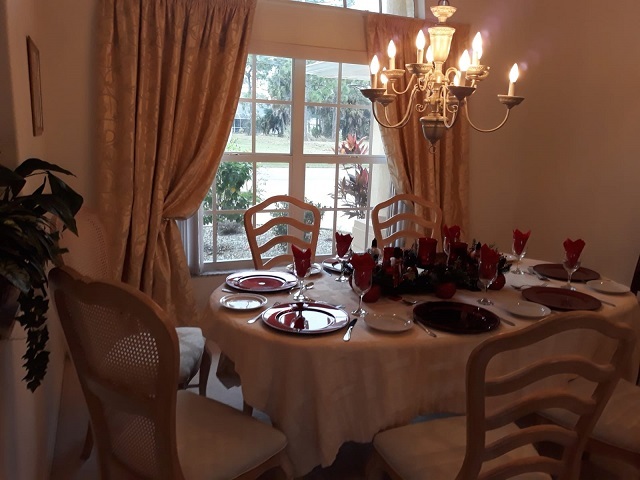 A spacious living area, with cathedral ceilings, comfortable seating for 6 people, cable TV, DVD player (with a selection of DVDs), a library of over 100 books to enjoy by the pool, games, jigsaw puzzles - everything you need for a quiet relaxing holiday. Sliding patio windows lead onto the lanai and pool area with views over the canal. The spacious Master bedroom has a Californian King Size Bed with the most comfortable pillow top (cashmere filled) mattress. 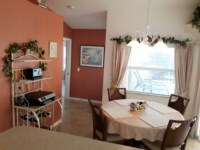 There is ample storage with sliding patio doors leading to the sun-deck and pool area. A door leads to an inner hall with large double-hanging closet and the master bathroom which has double basins and storage cupboards, corner bath, large walk-in shower and separate toilet. A sliding door, on the far side of the villa, leads to two further bedrooms and family bathroom giving the option of two master suites when two couples are sharing. 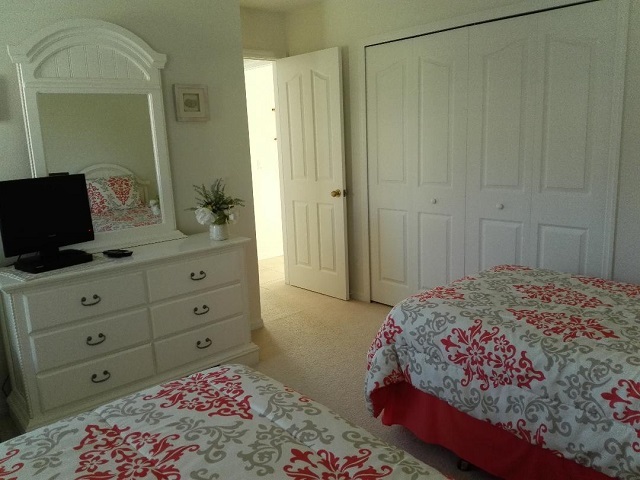 Another spacious bedroom with queen-size bed, sliding patio doors leading to the pool area, ample drawer storage and a large hanging closet. Twin beds, ample drawer and hanging storage. 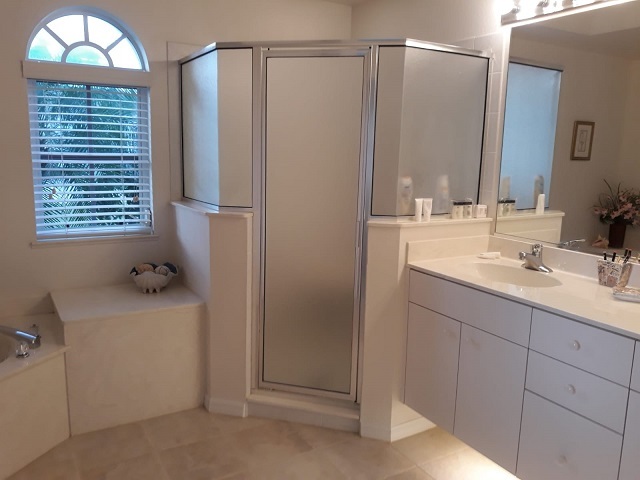 Large shower, single basin with storage cupboards. All linen, towels and hair-dryers provided. The Master and Queen bedrooms have TV but the third bedroom has no cable service but a DVD player. A spacious luxury fitted kitchen with Cooker, Hob, Microwave, Fridge, Freezer (with built in ice-maker and water dispenser), Dishwasher. Fully equipped to cater for all your culinary needs from boiling an egg to a gourmet meal. A separate laundry room with washing machine, tumble dryer, iron and ironing board is stocked with pool and beach towels. A door leads to the garage with cool boxes, beach chairs and sunshades for picnics on the beach. Inside the villa are 3 separate dining areas. A formal dining area seating 6, a casual dining area for 4 in the breakfast nook and an outside patio table seating 6 in the lanai. Air Conditioning and fans throughout. Telephone in kitchen and master bedroom. 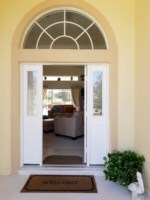 Our villa is fully maintained and cleaned before and after every stay. Above the table is a fan for added comfort. Outside the pool cage is a gas barbecue. Low season prices from $0.00 / £665.00 per week. Peak season prices from $0.00 / £800.00 per week. From £95 per day low season to £120 per day high season. Rates include all taxes. This is for the entire villa and NOT per room. For rentals of less than 7 nights there is a cleaning charge of £100. To reserve the villa a deposit of just £100 per week (£200 per week at Easter and Christmas) is required. The Balance plus a refundable £200 security deposit is due 8 weeks prior to arrival. The security deposit will be refunded after you return home. Payments may be made direct to out bank account or by cheque. peaceful scene A perfect spot for relaxing Master with pool and sunrise v Master bathroom. Queen Bedroom. 04 May 2019 to 18 Sep 2019 - use the form below to enquire about these dates. Average rating: 5.0 / 5 from 19 reviews. An outstanding villa in an idyllic spot. A beautiful villa with everything we could possibly need for a really relaxing holiday. The house and it's surroundings are so quiet and peaceful. When we could tear ourselves away from relaxing by the pool with a good book or watching the local wildlife everything was only a short drive away. Golf, walking trails, perfect beaches, opportunities for all kinds of water sports, good local restaurants and supermarkets and plenty of opportunity for retail therapy. After a hectic year it was perfect. We are now counting the weeks until we return. Owner's response: So pleased you enjoyed your stay, please come again! One of the best homes we have stayed in in Rotonda. We just wanted to let you know how much we enjoyed our stay at Herons Way. The villa was furnished beautifully and we found it extremely comfortable. Our weather was perfect with temperatures in the 80’s at times with virtually no rain for the whole month - a little different from the weather on our return to the U.K! We saw the ‘gator on several occasions. The herons, ibis etc. were all fascinating to watch. Owner's response: Hope to see you again! Our third visit but the house was still as outsanding as we remembered. We spent Christmas and New Year at Herons Way. Even after three visits this villa still has the wow factor when you walk in. The weather was beautiful reaching 80F+ most days. The pool was beautiful and so inviting after a day on the beach or shopping. Long Meadow Lane is so quiet and peaceful. We enjoyed watching the local wildlife and even saw two Osprey's fighting over a fish one had caught in the canal. Owner's response: So pleased you loved it, come again!! Our best stay in the US. Loved your villa and the location – blown away by the wildlife and birds – could not get enough of watching it all from the poolside. Thank you for providing us with a great end to our holiday. Owner's response: Glad you enjoyed your stay. Gorgeous location and you can not beat that pool. Loved watching turtles and birds from the pool. Owner's response: Thank you for your comments. One of the best we have stayed at in Florida. We have had a great time in Rotonda and enjoyed many nice meals. We hope to return one day soon. Owner's response: Many thanks for your review. I trust it will not be too long before you return. We spent a lot of time on the pool deck and in the pool which has been nice and warm. The villa and gardens are lovely. We have enjoyed every minute and will be looking forward to our return visit next year. Owner's response: Look forward to your return next year. A most enjoyable holiday. We appreciated the quietness in the area compared to Orlando. The restaurants are fabulous. We will return. Owner's response: So glad you enjoyed your stay. We have appreciated the lovely touches that make one feel at home. We ate out every night as the restaurants in this area are so quaint and well priced. It is a wonderful area and we also appreciated the quieter surroundings. We saw an alligator on our second day swimming down the canal. We will look forward to our return. Owner's response: Thank you for your comments. I look forward to your return next year. One of the best houses we have stayed in. The house was lovely, it did not feel like a rental, very nice. Thanks for giving us the opportunity to stay and we hope to return one day. Owner's response: Many thanks for your comments. We aim to make our home a 'home from home' where our guests can unwind and enjoy the beautiful area. Hope to have you stay again sometime. We would like to thank you and your family for letting us stay in your fabulous home. It had everything we needed with a great pool which we all really enjoyed. We have already started recommending it to our friends and will definitely be back ourselves in the future. We loved the coast and particularly the wildlife. Please pass on our thanks to Mary as she is doing a great job keeping the house in tip top condition. Owner's response: Many thanks for your comments and for passing on recommendations. We look forward to you returning in the future. I wanted to say what a truly wonderful home Herons Way is and that we had a wonderful time! Huge thanks for everything. We went to Family Friday to see the Stone Crabs, did a fab kayak tour with Hooked on SUP where we saw a whole family of manatees and came home with some sharks teeth of course! Thank you for all your recommendations. Owner's response: Thank you for your review. So glad to hear you had a great time. Hope you will return again sometime. This villa has the wow factor as soon as you walk in the door. My family have stayed here several times now yet this villa continues to exceed our expectations and is always even better than we remember it! It has the wow factor as soon as you walk in the door - it's immaculately clean, beautifully furnished and the view through to the pool makes me want to jump right in! We ate every meal outside making the most of the peaceful location and lovely views of the canal, the wildlife and some spectacular sunsets. We spent most of our time in the pool (given a choice I don't think my kids would have ever left it!) which was beautifully warm and the perfect place to relax and unwind. When we did drag ourselves away we really enjoyed the great local beaches and sampling the local restaurants. I highly recommend this villa, in fact on the flight home we were already discussing when we would go back!! Owner's response: Thank you for your comments. We are continually updating our villa so that returning guests still get the Wow factor. Hope it is not too long before you return. Owner's response: Glad you enjoyed your stay. Hope you will return again. Our first time in Rotonda. We definitely want to return and hope your villa will be available. The pool is the best in any villa we have stayed in. A ‘grown-up’ pool, just the right size and depth. Just to say we have had a lovely stay in your excellent villa – so very quiet all around. This is our eighth stay in Rotonda so we know our way around the area. Best pool ever – right size, shape and depth for easy swimming. Hopefully we will be back in the future. Owner's response: Thank you for your comments. Look forward to yu staying again. Best Christmas away from home. Absolutely glorious weather – high 80’s all week long. 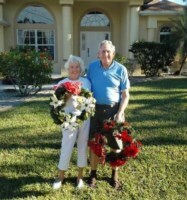 Maureen and Cliff’s home is always reliably clean, comfortable and well quipped. Everything you need is here. Early morning walks at the beach, lunch at one of the local restaurants then back to relax by the pool – perfect. We always thoroughly enjoy ourselves at Herons Way and would recommend a holiday here at any time of the year. Hopefully we will be back next year. Owner's response: We are so glad you enjoyed Christmas in our villa. Always a lovely time of year in Florida. A wonderful time at Heron's Way. The weather was gorgeous and we had a good rest. It was the perfect mix of time to ourselves and time with friends who live in Nokomis. We are looking forward to staying there next year as we discussed. I have to compliment you again on how clean your villa is!! Owner's response: I am so glad you enjoyed your stay. Your dates for next year have been booked. Your enquiry will be sent to villa ref 1267 only. This page has been viewed 53514 times since 18 Jan 2004.